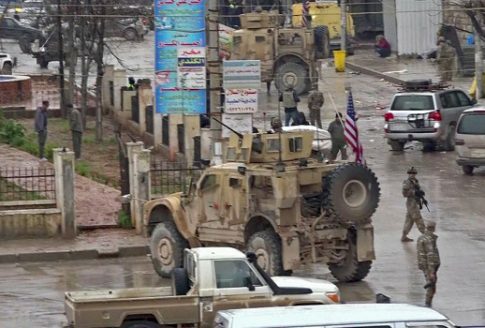 An attack in Syria killed several Americans, the spokesperson for the U.S. mission against the Islamic State confirmed Wednesday. In a tweet, the Operation Inherent Resolve spokesperson confirmed the deaths and indicated plans to "share additional details at a later time." The United States remains in Syria as part of a multinational effort to defeat regional ISIS forces. The statement follows open source reporting earlier Wednesday of a major explosion in Syria. Confirmation of affected Americans while "conduct[ing] a routine patrol" followed footage of a helicopter hovering over the alleged blast site. Three U.S. service members were wounded in addition to the four Americans killed, Reuters reported. More than a dozen individuals in total were killed by the blast. The American deaths included two U.S. service members, a defense contractor and a Department of Defense civilian, the U.S. Central Command said in a statement. Reports place the attack in the city of Manbij, located within 35 kilometers of Syria's Turkish border. Kurdish forces, U.S. partners in the fight against ISIS, control the area. The ISIS-run news site Amaq claimed "that the attack was carried out by a member of the group wearing a suicide vest," according to CBS News. A photograph shared by a risk advisory firm on Twitter appears to show part of the fallout. Roughly 2,000 American troops remain in Syria, where they have operated since intervening in 2014. In December, President Donald Trump announced an immediate withdrawal. Shortly after the announcement, Secretary of Defense Jim Mattis resigned due to differences between him and the administration. Though Trump has since tempered expectations for the withdrawal, conditioning it on the defeat of ISIS, U.S. equipment is already leaving the country. Update 1/17/19 9:50 a.m.: This report has been updated with a statement from U.S. Central Command about those killed in the attack. This entry was posted in National Security and tagged ISIS, Syria. Bookmark the permalink.